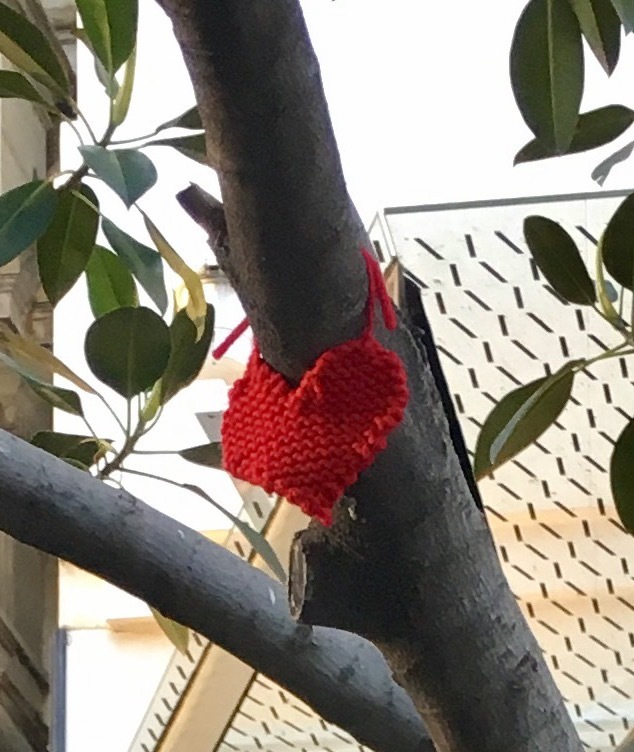 Last week I posted on Facebook about my little knitted heart dedication for the Melbourne Bourke Street tragedy. I've had such lovely feedback about this, I wanted to share a tutorial on how to knit the simple hearts. 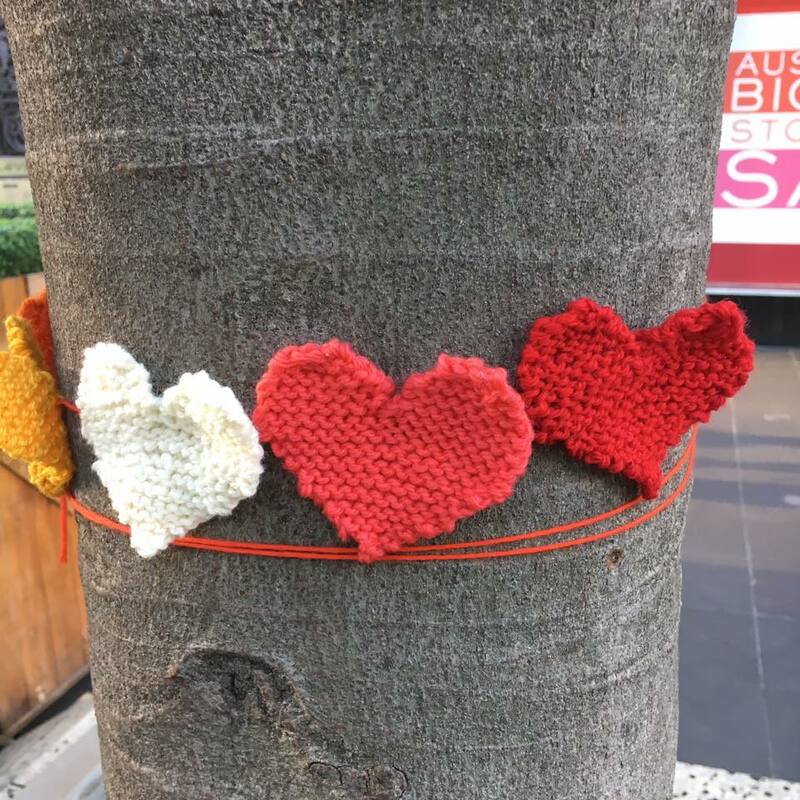 Perhaps you can knit some and add them to my display on the tree in Bourke Street Mall near Ca de vin. This is my guide to the Julie & the Knits pattern. You don't need to be too precious about this project. I knitted the hearts with scrap wool I had lying around. I tried to use similar ply and tones, but that's about it. For me it is more a project of the heart. In fact if you make a few mistakes and things look a little wonky I actually think it adds character. Life isn't perfect and we don't need all our creative attempts to be flawless. I have used 4mm needles and 8ply or 10ply yarn. You can use any yarn/needle combination that you have available. 2. Increase by one stitch by knitting into the front and back of the first stitch. Following row increase by knitting into front and back of first stitch. Push this knitting along the needle to start second top of heart on the same needle. Repeat actions 1 through to 5. Knit the next row and join the second top to the first. You can sew in this end later. Knit across all 16 stitches for 4 rows. Next row, decrease by knitting 2 stitches together at beginning of row. Continue to decrease by knitting 2 stitches together at beginning of every row until you have 2 stiches remaining. Then sew in all ends. If you wish to make a garland of these hearts. Arrange in order take a long piece of chosen yarn to thread through middle of the back of each heart. This works best for the small hearts and if you are tying on a solid wall/tree. If your hearts are larger than these, the top may droop over. No one wants a droopy heart! Another garland option is not to sew the 2 cast on tails at top of heart. You can then tie them together in a knot you can then thread the hearts on a string/ribbon or hang them where you wish.